Creatine supplements are nutritional dietary adjuncts that are often used to improve exercise capability and increase muscle mass. Creatine is a natural chemical that your body can produce. Some people, especially athletes, need extra amounts of creatine in order to improve physical performance. 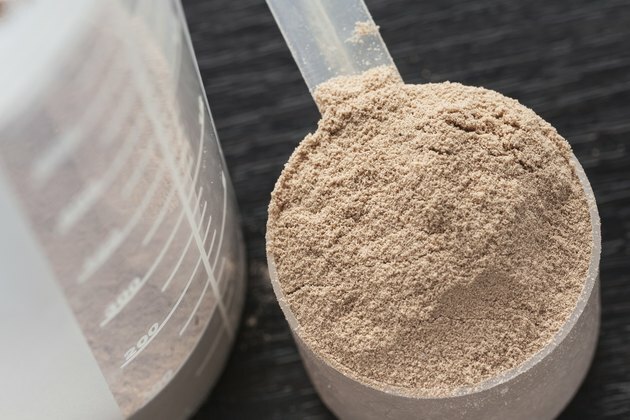 However, like most nutritional supplements, creatine supplements are not strictly regulated and thus can produce numerous, possibly dangerous, side effects. Gastrointestinal problems are a common side effect of creatine supplement use. You may experience a decrease in appetite, stomach pain, diarrhea, nausea and vomiting. These effects are often temporary or dose-dependent. Consult a doctor if these symptoms persist or worsen over time. If you decide to add creatine supplements to your diet, you may experience unplanned weight gain. This weight gain is mostly due to water retention within your muscles. Creatine supplements may increase the creatine levels in your muscle tissue, which in turn increase the amount of water your muscles store. Exercising regularly can help counteract this side effect of creatine use. Creatine supplements have been linked to muscle damage. Athletes who use the supplement have experienced severe muscle cramps, tears and discomfort. Creatine supplements may increase the risk of strains and sprains due to dangerous increases in workout programs. Therefore, do not suddenly add to your exercise program after taking creatine. Rather, slowly build up your body's exercise tolerance so that you avoid potential muscle damage. Acute kidney failure is a serious danger related to the use of creatine supplements. High doses of creatine, more than 10 g per day, can cause rapid muscle breakdown. The muscle breakdown releases chemicals and proteins that can overload and damage your kidneys. Acute kidney failure is a medical emergency that may require dialysis. Without treatment, kidney failure may result in death. Excess levels of creatine in your muscles forces your muscles to absorb water that is normally used by other parts of your body. This increased absorption coupled with intense physical training can often lead to mild or severe dehydration. Dehydration can cause mild symptoms such as increased thirst and fatigue, but may also lead to more dangerous effects like coma and death. If you take creatine supplements, increase the amount of water you drink and avoid exercising in the heat. Always consult a physician before you use creatine supplements. If you suffer from asthma, creatine supplements may not be a good choice for you, because they can worsen symptoms. Some people may also be allergic to creatine, a problem that can cause a rash, itching or shortness of breath. Do not take creatine if you're pregnant or breastfeeding, because it's safety under these circumstances hasn't been established.